On the final day of qualifying at the BB&T Atlanta Open, every loser but one was lucky and advanced to the main draw. The only unlucky loser just happened to be the hometown favorite. Kevin King, who played college tennis at Georgia Tech and is from Peachtree City, Ga., lost 6-2, 6-1, to John-Patrick Smith of Australia on the Atlanta Journal-Constitution Grandstand. Smith broke King’s serve four times and coasted to the routine win in just over 58 minutes. The win qualified Smith for the main draw. King, though, will not be entering the singles main draw. He is Monday’s only qualifying loser who isn’t advancing. The BB&T Atlanta Open had four openings for lucky losers Monday, and King’s ranking was the lowest of Monday’s four losers. “It’s tough that I didn’t put out a better effort today but hopefully next year will be better,” King said. On Stadium Court, Michael Venus, who played college tennis at Louisiana State University, faced American Rajeev Ram. The two were tied at 5-all in the third set. Then Venus earned a service break when Ram hit a backhand passing shot wide. “I wanted to try and make sure I was coming forward and being aggressive,” Venus said. He closed the match with an ace, winning 7-5, 3-6, 7-5. Venus looked fresher than Ram, despite also playing three sets on Sunday, including two that were decided by tiebreakers. Venus said he prefers playing in the heat and is used to the humidity; he trains in Bradenton, Florida, at the IMG Tennis Academy. Later, his day got even better when he learned that he had received a bye into the main draw second round. “That was a bit of a shock,” said Venus, who is from New Zealand. His second-round match in Atlanta will be only his third ATP Tour main draw singles match, he said. Ram, who lives in Indiana, also will play in the BB&T Atlanta Open singles main draw. Another American also advanced to the main draw Monday despite losing. On the AJC Grandstand, Alex Kuznetsov was up a break and serving 3-2 in the third set against Illya Marchenko of Ukraine. Then Kuznetsov double faulted, made three more errors and got broken at love. Marchenko earned another break and won the match, 6-3, 3-6, 6-3. Both men qualified for the singles main draw. Earlier Monday, on Court 3, Thiemo de Bakker of The Netherlands retired with the score at 7-6, 0-2. 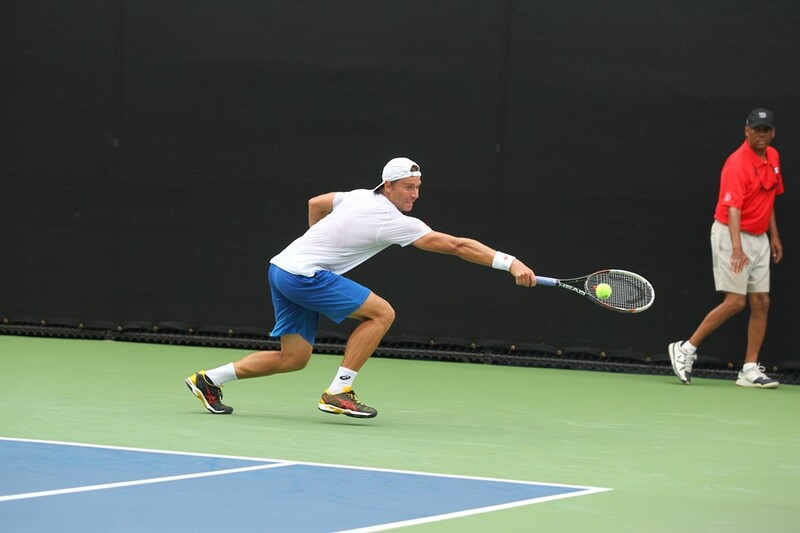 But both de Bakker and his opponent, Steven Diez of Canada, also will play in the singles main draw.